Below you will find pages linking to our cars and other equipment. We will attempt to share pictures, forms, and other types of useful information for each. Here you will find more information on our B6D and other information related to 1/10th scale 2WD buggies. Here you will find more information on our B44.3 and other information related to 1/10th scale 4WD buggies. 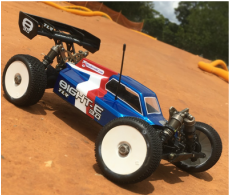 Here you will find more information on our TLR 8ight E 3.0 and other information related to 1/8th scale 4WD buggies. Here you will find helpful information that is not classified under a specific car and other helpful techniques.